It’s been a quiet few months here on the Alameda History blog, but work has continued and the history radar has been tuned in to several topics and stories. 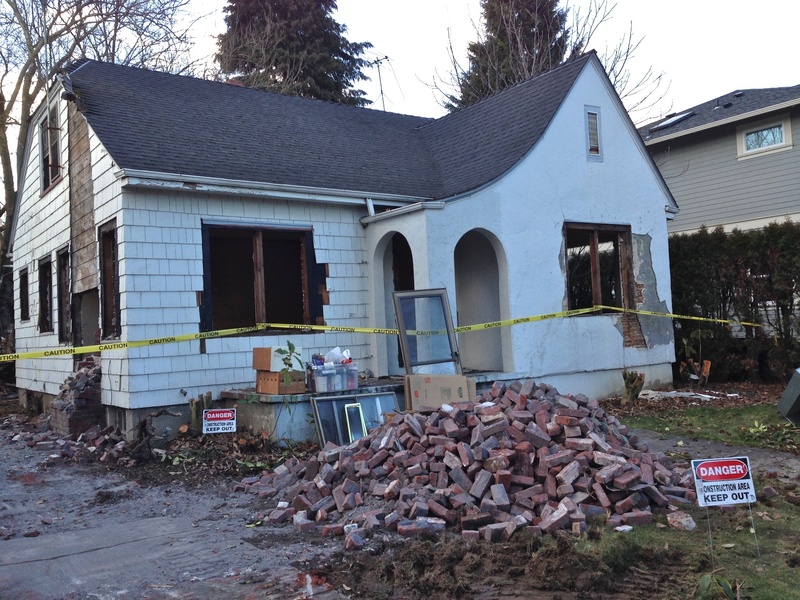 Like you, we have been watching with dismay as the trend of tear-downs has swept across the eastside. A changing market has meant that the value of the actual lot has eclipsed the value of some older homes, allowing developers to demolish and build new, and still make a profit margin. The result is typically larger, less historically appropriate homes shoe-horned into lots never designed to hold such large buildings. We’ve written a bit about this trend here in Alameda. Clearly, this is a living and changing neighborhood—which we imagine few would object to. It is the prerogative of the present to redefine, reinterpret and reuse what the past has provided. Still, there are implications. And in our view there is the obligation we owe to the future to be thoughtful with the current and historic character of this 100-year-old-plus neighborhood. Wednesday, June 11 2014, 6:30 to 8:30 pm at Concordia University’s Luther Hall, 2811 NE Holman. 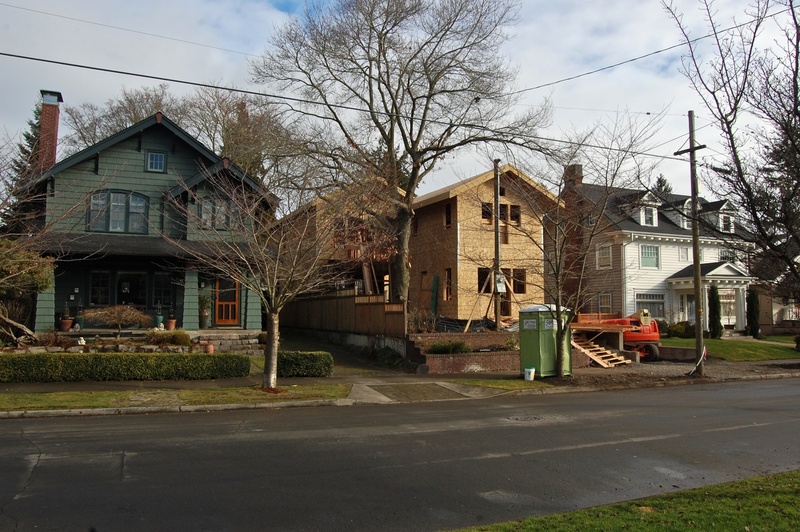 What are the City’s regulations around residential tear-downs and new construction? How do these trends affect neighborhood affordability, stability, and equity? What are the environmental issues around the demolition of building? What is attracting home builders? This is an important topic that deserves attention and consideration. 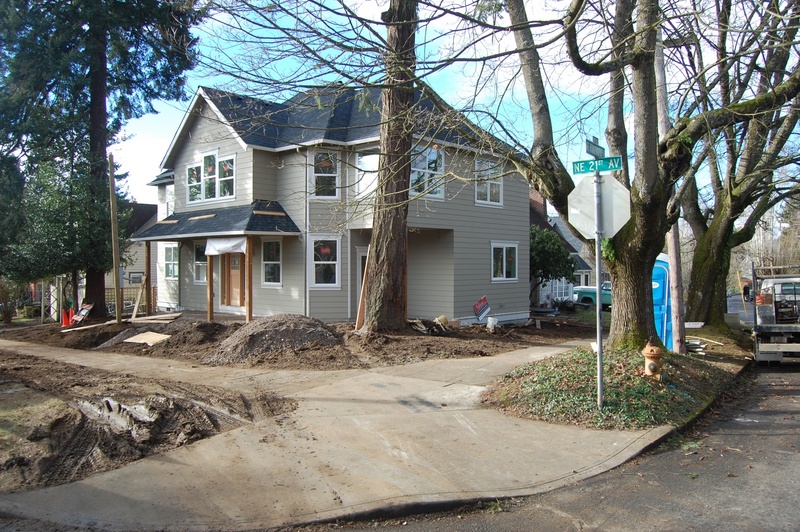 It’s been almost a year now since the Frederic Bowman house at the corner of NE 28th and Dunckley was demolished, and here’s what’s being built in its place. You may remember the graceful fixer-upper that sat far back on the big corner lot one block north of the Alameda Ridge. The classic 1922 Mediterranean style villa was originally home to the William and Susan Illidge family. 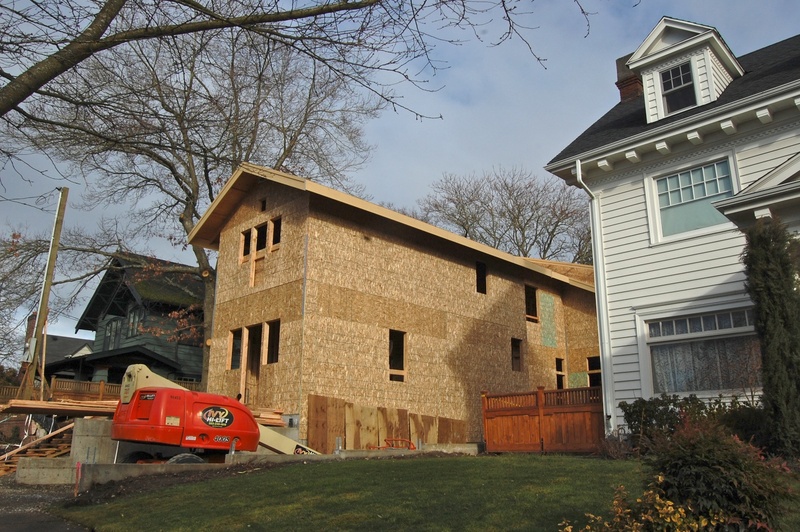 The house was demolished and the lot subdivided to make room for two new houses. We’ve been watching construction of one of them. Here are a few views. Hmm. Wonder what the neighbors think: it’s awfully close. We embrace many architectural styles and traditions (the neighborhood is filled with variety), but we do have to say that it’s still hard to lose the classic Bowman style, and to clutter that formerly open corner with two new houses. That’s right, there’s another house yet to go in between the old stairway (above) and the new house in the background. I’ve heard neighbors refer to this first new house as a “big barn.” Others think it looks more like a space ship settling in next door to its Dutch colonial neighbor. In the last week, we’ve had a chance to walk every street in the original Alameda Park plat (and nearby) and can report a handful of other tear-downs or major remodels that have replaced original homes. Here’s a quick look at what we’ve seen. This little cottage above is on NE 29th, just north of Siskiyou. Will watch to see what it becomes. 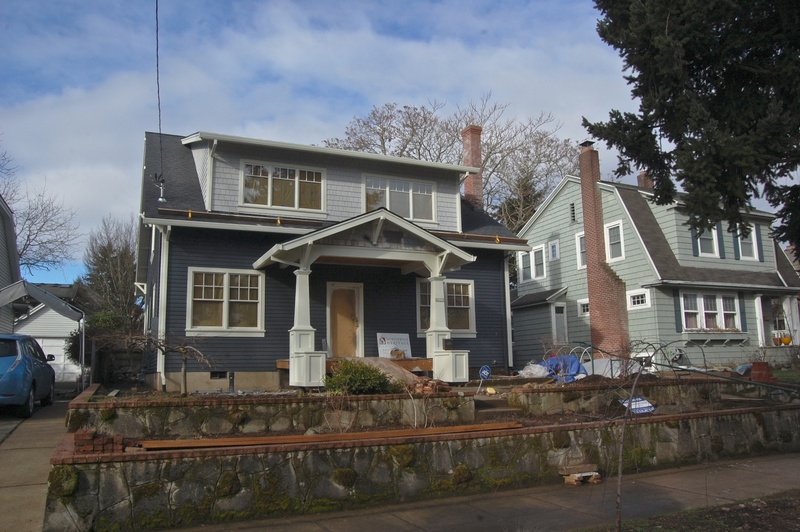 The only original components of this house above, located on NE 32nd Place just north of Shaver, are the columns and some of the front porch archway, but the rest of the new house behind it actually fits in quite well with the neighboring homes in terms of scale, design and material choices. 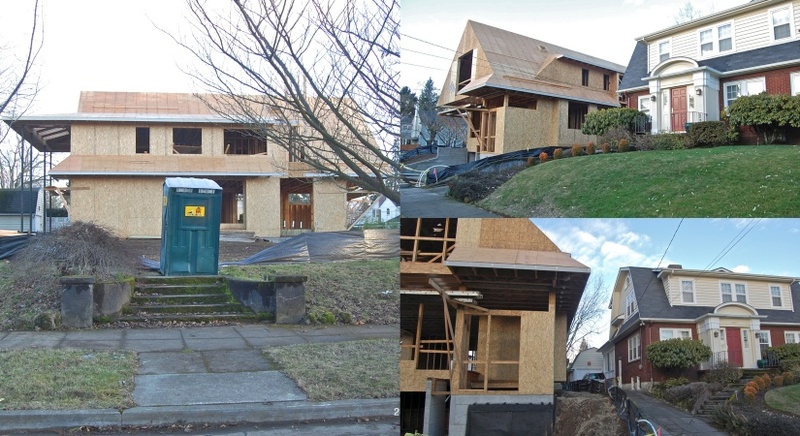 Here’s a tear-down at NE 21st and Ridgeview that expanded the overall footprint of the house on the lot and that now dwarfs the neighbors with its large scale. 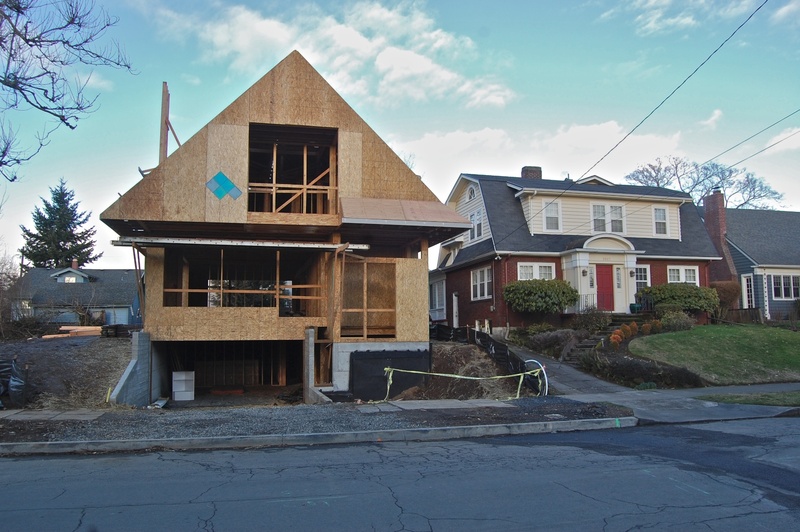 The tear-down trend, driven by an improving economy, is increasingly visible in Portland’s eastside neighborhoods. We’re always glad to see sensitive restorations and renovations done (and to know that this economy has some resources to invest in upkeep of our older homes) but the tear downs do alter the sense of place. An organization called Restore Oregon is helping to raise the profile of this trend and offer some considerations and solutions. Check out RO’s recent post on the topic, which features a photo from Alameda. 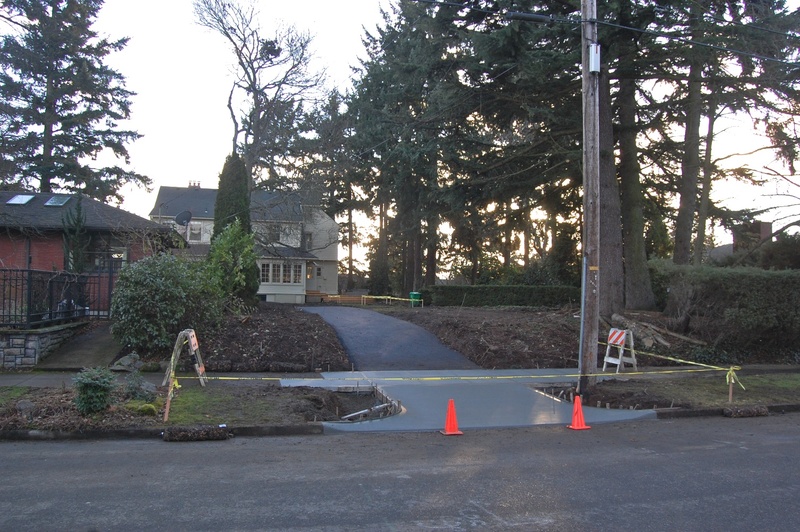 Below is another one that is going to come as a surprise (at least it did to us): The new driveway installed this week on the south side of Alameda Street just west of Alameda Terrace provides new access to the existing older home that faces Alameda Terrace (3251 NE Alameda Terrace, built in 1913). And the existing driveway will now serve two more houses that will be built on the remaining lots. Up until this week, the Alameda Street side, pictured below, was a tall laurel hedge. Will welcome some discussion about all of this: upside/downside, examples and observations from neighbors.